Rebounding is a complete cellular exercise, stimulating the activity of the lymphatic system (a critical part of the immune system). Rebounding 3-5 times per week at a minimum of 10-15 minutes at a time is highly beneficial. It is effective at a minimal bounce, using acceleration and deceleration, with each bounce, to open and close the one-way valves between the lymphatic system and the cells. Lymphatic fluid surrounds all of the cells of the body. While bounding toxins, poisons, and metabolic waste are pulled out of the cells into the lymph fluid, while oxygen and nutrients (transferred previously at the capillaries, from the blood) are pulled in the cells from the lymph fluid. Within the lymph system are lymphocytes, for example- white blood cells, which consume metabolic waste, bacteria, and dead cells. Rebounding keeps the lymph system moving and unplugged, so lymphocytes have free reign to do their job. More importantly, bounding does this without stressing the hips, knees, or ankles, or creating shin-splints. It can be done on a daily basis or multiple times per day without creating overuse injury. What is the Lymph System and how does it help me? The lymphatic system acts as a secondary circulatory system, except that it collaborates with white blood cells in lymph nodes to protect the body from being infected by cancer cells, fungi, viruses or bacteria. The lymphatic system is a system of thin tubes that runs throughout the body. These tubes are called ‘lymph vessels’. Unlike the circulatory system, the lymphatic system is not closed and has no central pump. It is not under pressure and only moves because of exercise or muscle contraction. When the lymphatic system is congested, the cells become deprived of oxygen, affecting the body’s ability to rid itself of its own waste material. Over time, other body systems that rely on the lymphatic. It takes only two minutes of rebounding to flush the entire lymphatic system, while cleansing and strengthening cells and lymph nodes. A further benefit to the body is that during this brief time span the white blood cells of the immune system triple in number and remain elevated for an hour. These specialized cells play a major role in the body’s defense against illness and disease. At this point another two-minute rebound session would increase the demand for white blood cells as the process of cleansing, strengthening, and the flushing away of spent cells and other cancerous debris is repeated. When beginning a program of regular rebounding it’s best to gradually increase time and intensity as the body – including bones and internal organs – adjusts to the increased gravitational load and becomes stronger. The lymphatic system, a major part of the body’s immune system, is a network of lymph nodes, ducts, and vessels that transport lymphatic fluid from the tissues to the bloodstream. Lymph nodes act as filters and remove bacteria and toxins. Their role is vital in maintaining health and the lymph system must be kept flowing in order to function correctly, especially for those suffering from chronic fatigue syndrome. People with chronic fatigue syndrome often have depressed immune systems, and a healthy lymphatic system will reduce the symptoms. Unlike the circulatory system which uses the heart as a pump, the lymph system relies on body movement, that is, exercise to circulate lymph around the body. When you don’t exercise sufficiently, the lymph system becomes stagnant and blocked. For those with chronic fatigue syndrome, it means your body is unable to efficiently dispose of toxins and bacteria and begin to heal. When you are feeling dragged down by cancer-related fatigue syndrome, exercise is the furthest thing from your mind. However, to reduce the symptoms of this syndrome you need to exercise to get your lymph system moving and rid your body of harmful toxins and waste. Lymph fluid is activated in three ways: muscular contraction from exercise, gravitational pressure, and internal massage to the valves of the lymph ducts. You don’t have to run marathons in order to get the exercise you need. 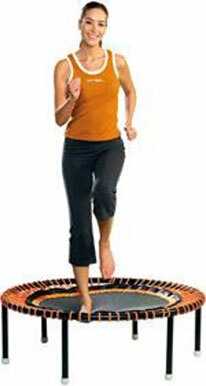 In fact, a mini exercise trampoline called a rebounder is the perfect exercise tool for you. For chronic fatigue sufferers, mini exercise trampoline rebounding is the most efficient and effective form of exercise to get your lymph system flowing. More Efficient Exercise: For those with cancer-related fatigue, mini exercise trampoline rebounding is a very efficient form of exercise. With most forms of exercise, you have to spend as much energy decelerating as you do accelerating. But when you exercise with a rebounder, at the bottom of a bounce the force is recycled upwards without you having to expend extra energy. For those with cancer-related fatigue, this energy saving is a godsend. When you bounce downwards, the mat absorbs the impact. Even though the impact is cushioned, it still strengthens the entire body more thoroughly than any other form of exercise. If you suffer from cancer-related fatigue syndrome, a strong body is your goal. Increased G-force (gravitational load), which strengthens the musculoskeletal systems. Aids lymphatic circulation by stimulating the millions of one-way valves in the lymphatic system. Your lymphatic system acts as your body’s internal vacuum cleaner. Establishes a better equilibrium between the oxygen required by the tissues and the oxygen made available. Increases the functional activity of the red bone marrow in the production of red blood cells. Improves resting metabolic rate so that more calories are burned for hours after exercise. Improves circulation. It encourages collateral circulation (the formation of new branch blood vessels that distribute blood to the heart) by increasing the capillary count the muscles and decreasing the distance between the capillaries and the target cells. Strengthens the heart and other muscles in the body so that they work more efficiently. Improves coordination between the proprioceptors in the joints, the transmission of nerve impulses to and from the brain, transmission of nerve impulses and responsiveness of the muscle fibers. Improves the brain’s responsiveness to the vestibular apparatus within the inner ear, thus improving balance. Rebounding for longer than 20 minutes at a moderate intensity increases the mitochondria count within the muscle cells, essential for endurance. ← Everything is OK, see you next year. If you have already purchased online access to the patient video you may click here to log in and view. Educated/Trained over 8oo U.S. healthcare/wellness professionals. 2012 Global Launch - The Pink Ribbon Program can now be found in Spain, Italy, United Kingdom, Denmark, Australia, Ireland and Hungary.